Hello loves! I hope you all had a wonderful Thanksgiving holiday weekend! I took Friday off of work and had a fun 4 days in Georgia with some family friends. It felt like a mini vacation and I had a blast. While in Georgia I did some quintessential “American” things such as shooting guns, playing with horses, and watching football – WAY too much football! I love southern Thanksgiving because the sides are so delicious. I was telling my friends that the difference between New England Thanksgiving and Southern Thanksgiving is the fact that in NE the turkey isn’t fried, the ratio of the broccoli casserole is more in favor to the broccoli than cheese, the green beans don’t have bacon, and the squash isn’t sweet potatoes and doesn’t have marshmallows or brown sugar encrusted on top. It may be healthier up north, but man, I think everyone needs to try a Southern Thanksgiving at least once in their life. 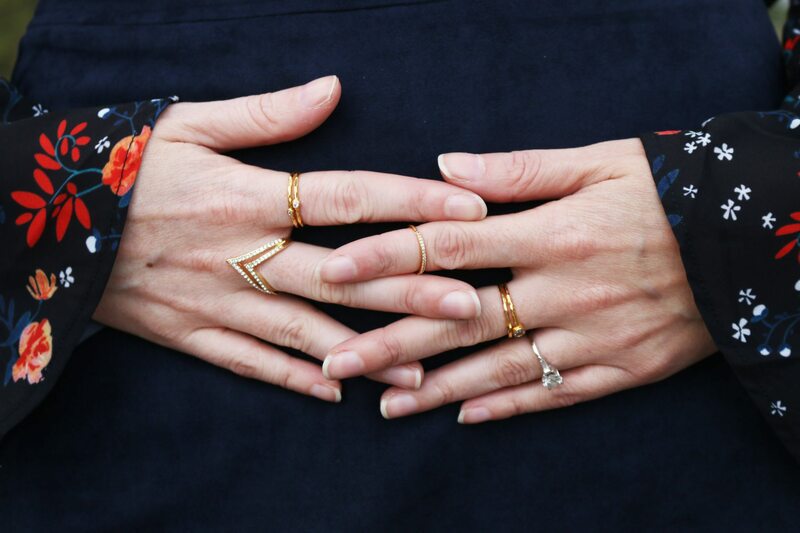 On to the outfit – I am wearing two pieces that I found at Nasty Gal. 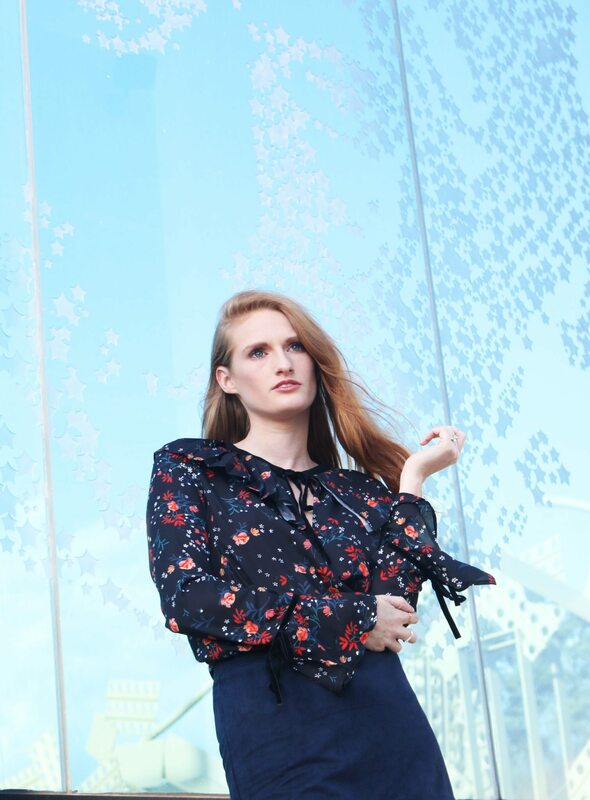 The navy bell-sleeve blouse is on sale for $40, and the scalloped skirt is also $40. 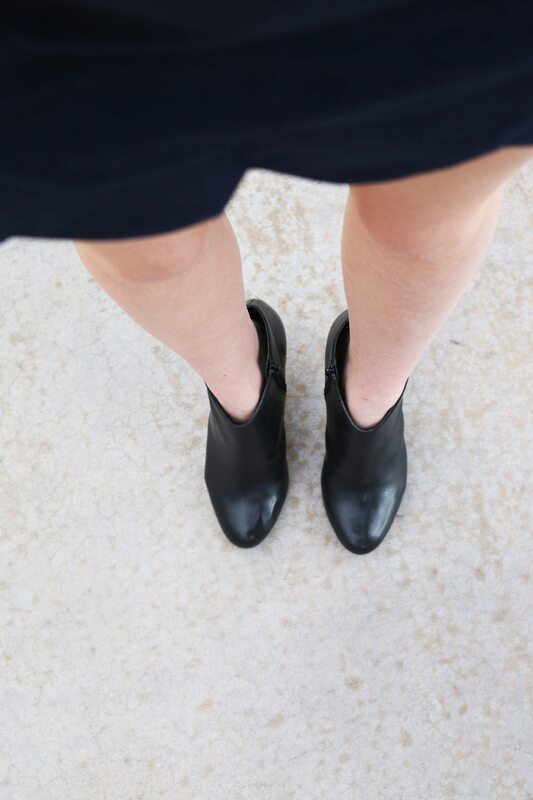 My Sole Society booties are so perfect because they are so versatile. You can wear them with bear legs, skinny jeans, tights, longer pants, whatever you want and you will look amazing! Does anyone else ever go into a store and buy a look that the mannequin is wearing? When I saw this blouse styled with the skirt on NG, I had to have both. And boom, here they are recreated on me! Tell me in the comments below, what did you do for Thanksgiving? LOVe the scalloped details on your skirt! So fun! The scalloped hem of that skirt is so cute!! Loving it paired with that blouse! I can’t wait to wear this skirt more often. Paired with tights and some OTK boots! Such a pretty top! Love the neckline! It’s so unique with the rufffles and the tie – it’s like 4 trends in one, how cool?! I love pieces like that and the neckline of the top is so cool, totally agree! I LOVE this look, Taylor! You are always so stunning! 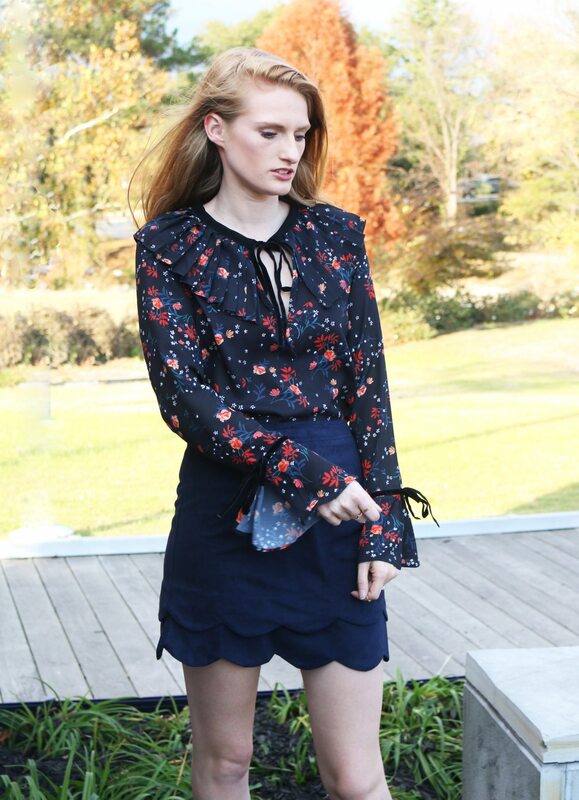 I love this fall floral blouse with the scalloped skirt. Perfect fall look! Thank you! 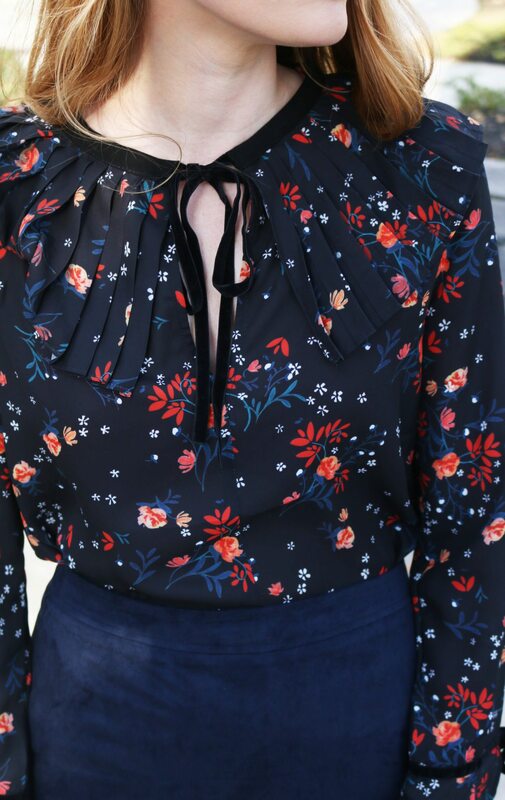 I’m so obsessed with this blouse! *oops! Typo on my first comment! This scalloped skirt is so adorable! 🙂 I’ve been so into navy lately and you totaly rocked it in this look! Thanks so much! Navy is such a great color and a good navy piece is definitely a wardrobe staple! Absolutely loving that blouse! Such gorgeous details! Love that you had a southern Thanksgiving-I’m from Georgia so I understand what you experienced lol. Glad you had a great time and hope one day I experience a northern Thanksgiving!! I was in Georgia for Thanksgiving! I watched the UGA football game in the stadium, it was so fun! Beautiful look! Navy blue has to be one of my favorite colors right now! I’m loving it too! Thanks so much for stopping by! This outfit is lovely. You are lovely. The details are AMAZING! Army Ragner by day, fashion photographer by night. I love him so so much for always having my back with my blog. Thanks so much for your kind words and support! The scallops on that skirt are amazing! I love how you styled this entire outfit, you look so amazing! It is so so good! Although you definitely need to hit up the gym a few times to work it all out. So worth it though! Anna you are so sweet! Thank you! I wanna go to GA so bad! Love the skirt, you look gorge as per usual! Georgia is so fun! I wish I could have made it to Atlanta, but next time I definitely will! This outfit is so flattering on you! Love it. I LOVE that skirt! The scalloped details and color are perfect!! Adore this look…the scalloped skirt is just perfect and the details on that top are pretty amazing ???????? Good luck w the deployment…I can’t say I’ve been in your shoes…but I’ve been a bit on the other end. I was a Redskins cheerleader in my 20s and we did a lot of overseas USO tours for the troops. More than once, grown servicemen would look at me or a teammate and start crying (this was back right after 9/11) and say they were looking at us and picturing “home”. It was truly one of the most humbling and a highlight experience of my life. So thank you to your hubby and thank YOU for your sacrifice!!!! I adore this scalloped hem on the skirt! It’s such a pretty detail 🙂 And glad to hear you had such a great Thanksgiving! Scott is a killer photographer! He gets all sorts of different angles and shots! Love this look and sounds like you had a nice Thanksgiving with the family. He likes to get creative with it, let’s just say that hahaha! Thank you so much Amanda! Barbara, you are so nice. Thank you! PS: Naby blue is divine on you!!!! Always so gorgeous Taylor! Love both pieces and they are perfect together! I just got a navy suede skirt and I can’t wait to style it. I’ll be thinking of you come December, you are one strong lady! Love this scalloped skirt and your booties! You are totally rocking this look lady! I love the scallop detailing! This skirt would also look good paired with a red blouse for the holidays. You look amazing!! I love that scalloped skirt so much! And I seriously need that top in my life. These two pieces styled together are perfection! Jamie you are so kind, thanks for your comment! Love this look, Taylor! I love anything scalloped, really. Thank you Aida! I’d love a pair of scalloped flats – those are super cute! So adorable for fall! Love the scallops! I feel like Navy gets forgotten about this time of year with all the red+green but it’s the perfect color for holiday wear! You’re so right! And the best part is you can style it with both colors! I love the outfit. It is really cute and blue is one of my favorite colors. Can never go wrong. this whole look is gorgeous . . . the navy against your hair is divine ! Thank you! I never really wear navy, but I’m thinking from now on I should wear more! The skirt is really cute! I can’t even imagine how hard it must be to have the deployment date looming ahead of you, but it must be nice to get to have at least one holiday together before that happens. Really does give meaning to Thanksgiving! Thank you so much for your support and kind words! It really means so much to me 🙂 Hopefully blogging will keep me focused and make the time go by faster! Wow I’m so in love with this look!! That skirt is perfection! You look beautiful babe! Navy is such a great colour on you. Scott does such a great job of capturing your beauty and super fab looks. Southern Thanksgiving sounds more like how we do up here in Canada, definitely good food all around! Hi Taylor! Thank you for visiting my blog! I am so glad you do because it gave me the opportunity to meet you! I love this style post and your entire outfit! Thank you so much! You are so kind 🙂 Hope you have a great holiday season as well! You look fantastic! Love the entire look. SImply stunning! Thanks for sharing! I love the details on the skirt! So cute! ^^. So happy to hear that you had a nice Southern Thanksgiving. The food is so yummy for sure ! You wear that skirt so well…. And Scott definitely captures your beauty. We will miss his photos of you while he is gone…..
Give him a hug for me. I will miss my partner in crime too! He’s such a trooper for helping me out with my blog the way he does. I really love this top and I wear it to work as well. It’s just so damn cute! I bet it would look killer on you! Loving the scalloped hemline of that stunning skirt! The vibrant electric blue color is so chic! Loved this look, especially that blouse – so pretty! Sending you and your boyfriend good thoughts – time with loved ones is very precious, and we too often take it for granted! Such a lovely look! That blouse is so pretty! THank you! I cut A LOT off in September to go completely my natural color again, it feels so healthy and fresh now! Thanks for the compliment! Love it. This is such an awesome photo shoot concept! Love your look head to toe! You look great, and I like that top is so chic and feminine at the same time. The boots were such a great idea because they add a subtle edgy vibe to the entire look! I absolutely love this outfit! And boy, does a southern Thanksgiving sound amazing! Definitely need to try those dishes. On a more serious note, I can’t imagine the feelings that you are feeling right now. Thinking of you!